Note: This is the second in the series giving backgrounds of the characterizations DARC members are planning to use for the LAM 2010 presentation. became as a man who was quick to spend money, but slow to finish the work. Although no longer young, Ketill sold his house and traveled to Iceland. making of nails and rivets or the forging of horse shoes. So it was there he heard the ale-told tales of Eirik and his Greenland. 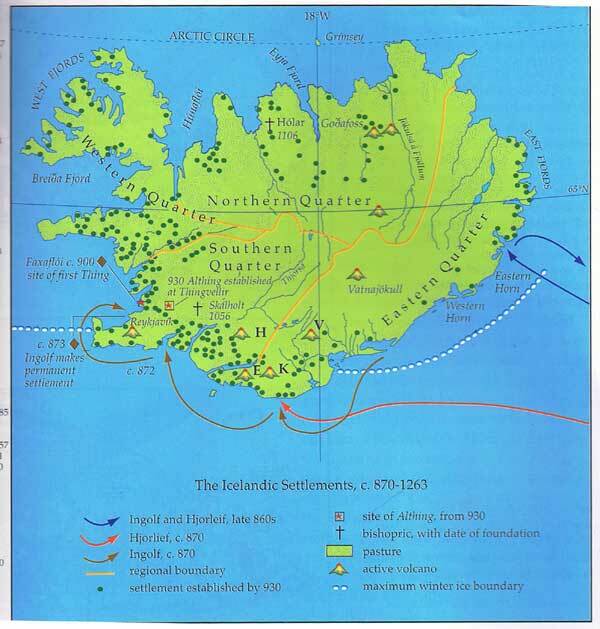 The Althing in Iceland of 1000 AD was an important one. As always, many disputes were heard and settled, to the gain of some and loss of others. 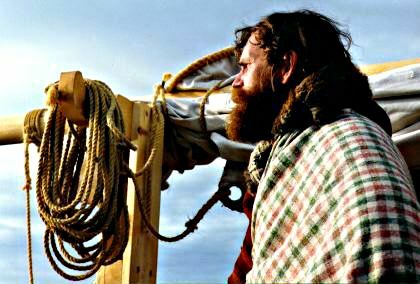 One of the significant decisions made at the Althing was to encourage all Icelanders to accept Christianity. This did not sit well with all. As always, many things were discussed, and deals made, away from the Speaker's Rock. Some came just to see and be seen. Traders and artisans came to display their wares, seeking customers and commissions at the gathering. The days of the Landham were now long gone, so the good (even acceptable) farm land had pretty much all been settled. Knowing this, minor chieftains were becoming less and less likely to even oath to new bondi, and not very generous if they did. The famine years were now just a distant memory to only the oldest Icelanders, but still the land was not as bountiful as it once was. 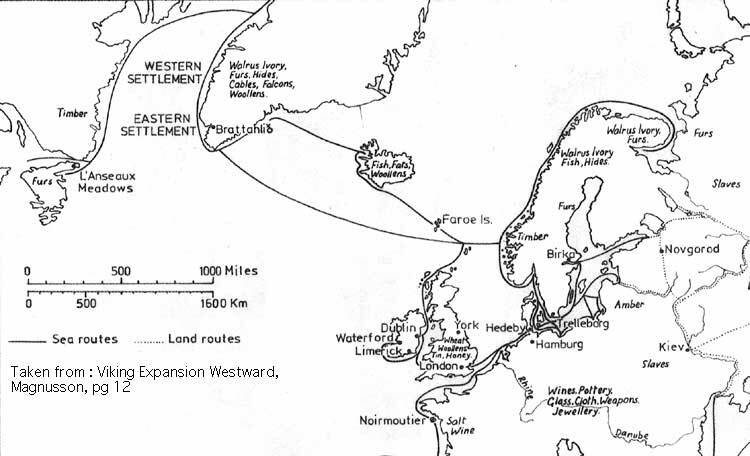 One exciting piece of news at the Althing was that of Eric the Red's new Green Land, and even mention of his son Lief's Vinland, both to the west. There was a man named Ragnarr Thorbergsson, once from Kaupang in Norway. He had come to Iceland, hoping to improve his status and increase his trading. Now Ragnarr was well known for this weather luck, but not so envied for his luck in travel. His travels never were outright disasters, but certainly things just never turned out as he boasted they would. 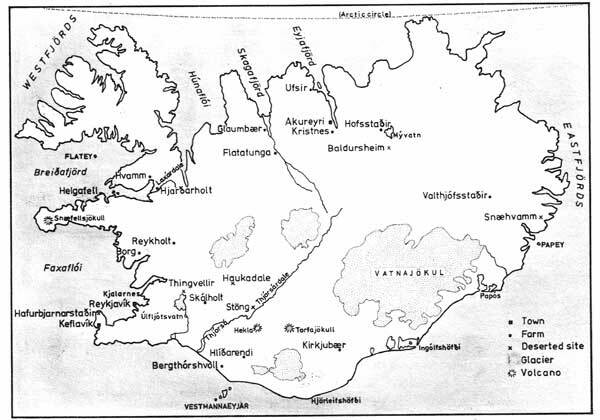 Ragnarr's schemes at the Althing had not worked as he had planned. He was certainly not alone in this. There were recent immigrants to Iceland, and even young families and second sons, all of whom found that there was no chance of good farm land in their future. There were some who felt the conversion to the new religion was just not to their taste. As always, there were those who felt a fresh start in a new land would solve what ever problems that always seemed to plague them. So Ragnarr, nothing if not shrewd, quickly hired a ship to sail to the new colony of Greenland. He gathered up a load of the hopeful and disgruntled who would pay him passage against the chance to settle on new farms of their own. As it happened, things didn't go perfectly on the voyage, with the ship blown off course. 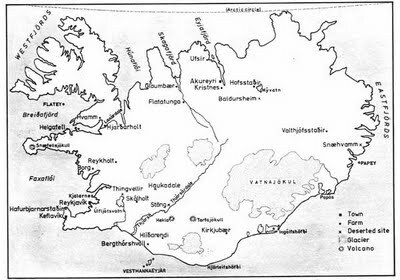 Like Bjarni before them, they found themselves near Vinland. Knowing the tales freshly told, they made their way to Leif's buðir and found some Greenlanders already there. Most were not pleased to find that they would need to lay over the winter before continuing to Greenland in the spring. This mixed group of farmers and craftsmen, of varied ages and original homelands, now finds themselves stuck together in close quarters in Vinland. They are settling in to this remote outpost best they can, and trying to help get ready for the winter soon to come. 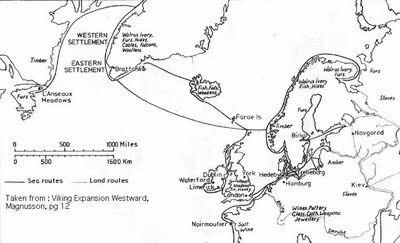 The ship and most of the crew has gone off down the coast to harvest valuable timber, hoping to improve their lot when they finally make it to Greenland. After DATE, the next most important consideration in characterization may be PLACE. The physical location for a character creates a framework that determines what they could know, what they might do, how they might look, and what objects they might have available to them. A town dweller in the home country is sure to be quite different than a farmer in a colony. For most historic periods, the stress should be placed on locally available resources. 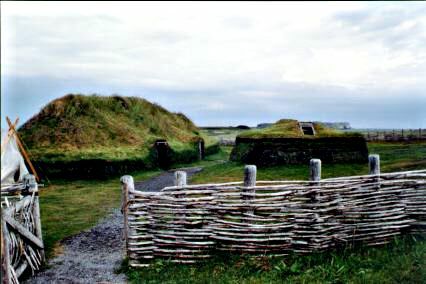 A good example of this can be found in building construction, where rough form may be cultural, but local materials determine the actual details. This is not always the case, as cultural factors might prevent local materials from being adopted. A nice example here would be early Canadian English freezing to death in cloth coats, because wearing Native style furs was 'just not British'. Access to imported goods has always been restricted, usually thus expensive. What might be easily available in a local area may become high status luxury in a distant place. The re-enactor is always constrained by the mechanisms of artifact preservation and recovery, a topic that will be dealt with separately. Even when hoping to keep centered to a specific location, lack of artifact prototypes may force you to expand your circle. The pattern is clearly a series of individual stepping stones, both as they moved westward, and as time progressed. 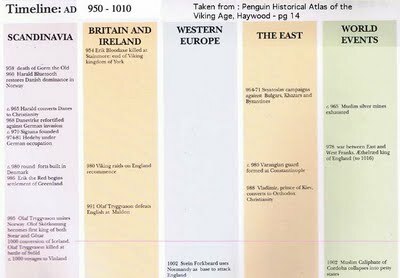 Using our determined time line at 1000 AD, within a normal life time, the primary focus for our characterizations should be Iceland. It is possible to expand slightly to Norway, Norse Scotland and Ireland. Iceland as a focus presents special problems in terms of artifact selection. 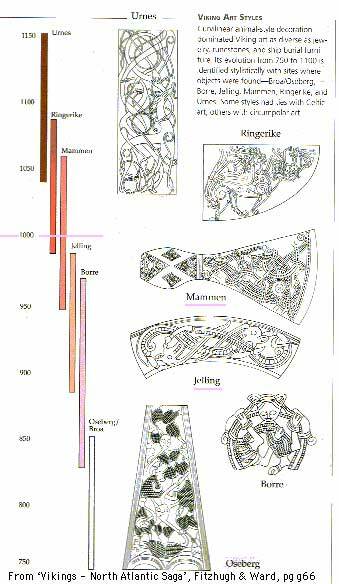 Although not marginal, it still had limited resources in terms of raw materials. There will be a considerable impact on the availability and quality of many 'commercial' goods, which primarily had to be imported from the outside. This overall tends to push objects upwards in status level. 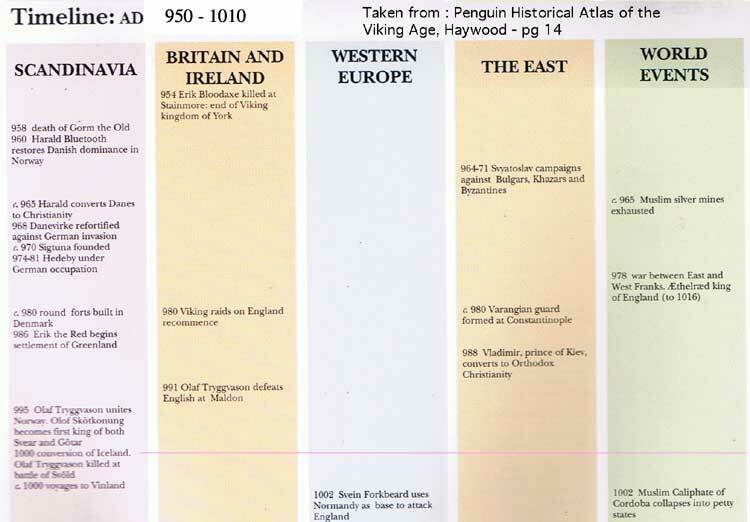 This is a generalized time line taken from the Penguin Historical Atlas of the Vikings. I have cut a slice here, which reflects the possibilities for any of DARC's historic characters. I have used a framework starting at 950, and running through to 1005 (as presented in the source table. This obviously lists the only the largest events. Key to this is fixing the year date of the presentation. Staff interpreters at LAM do not refer to a specific date in their presentation. If pressed, they will vaguely reference 'about 1000 AD'. There are a couple of differing ways a living history program could deal with this statement of dates. 1) Refer only to some general historic era (Viking Age). As you might guess, this generally supports only the lowest level of characterization for the individual interpreter (commentary or 3rd person). 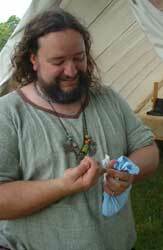 2) Relate to a general event (Norse at Vinland). This appears to be the approach being taken at LAM by the staff. Again this supports 2nd person, maybe 1st person characterizations. This would narrow the focus down to roughly 1000 - 1020 AD. The year 1000 is most likely to be given as the general round number. 3) Pick a specific year. 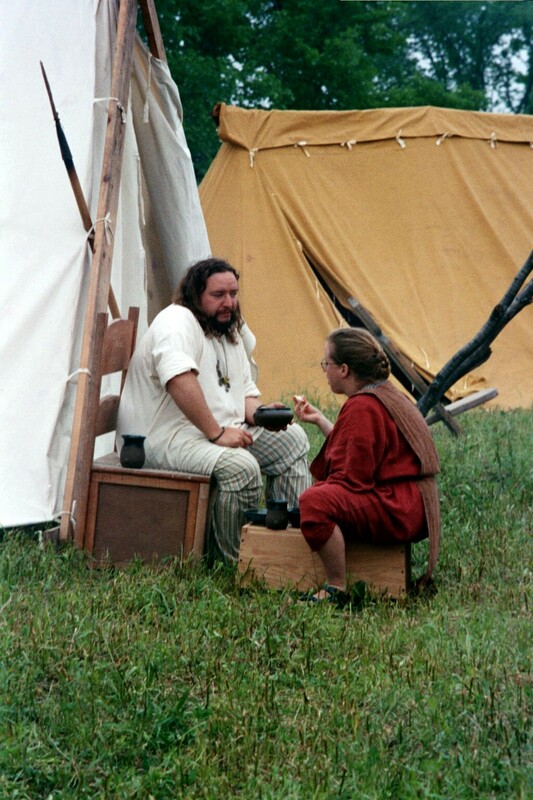 Often this target year is researched in great detail, then repeated annually (an example would be Plimoth Plantation) This becomes most useful when delivering full role playing characterizations. 4) A specific, but shifting, year. In the past this has been the normal approach used by DARC, typically we have simply subtracted 1000 from the current year. Now, one potential problem with the use of a single (repeating) target year is that it does not have provision for the natural ageing of interpreters. DARC has attempted to deal with that by using the shifting date. This is only a problem when you are considering the deep details of a characterization - which is 'what do I know'. Obviously, some of us have characters that have been presented, sometimes with little modification, for over 15 years. Obviously, 'we are not the (wo)men we once were'. So the slice of time seen above brackets the potential life of our oldest character (certainly Kettil), but does not extend much past the Vinland presentation date. Obviously there needs to be a regional aspect added. If Ragnarr is originally from Denmark, what he knows about events is most certainly different from what Kettil knows (Norway born). The next posting will look at geography.